The punishment for the contravention of this law shall be, at the discretion of the Clave: the separation of the parabatai in question from each other, their exile from their families, and should the criminal behavior continue, the stripping of their Marks and their expulsion from the Nephilim. 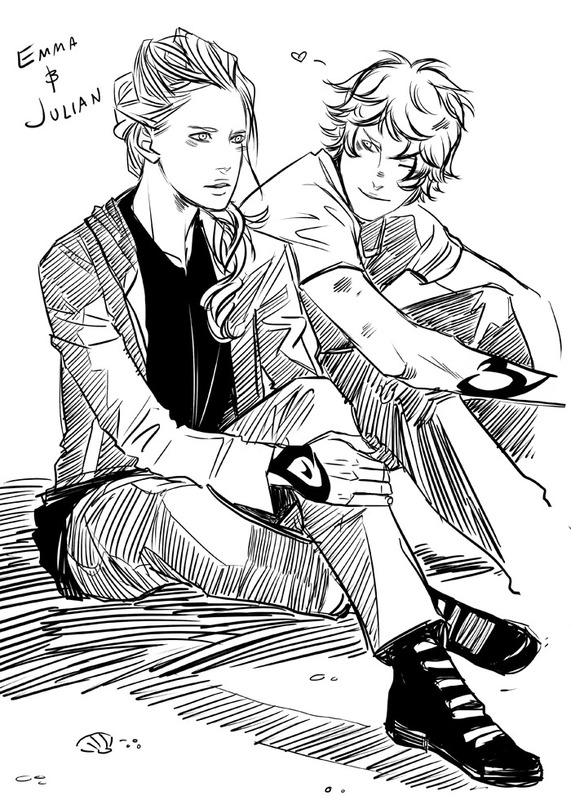 Never again shall they be Shadowhunters. So it is decreed by Raziel. Dura lex, sed lex. The Law is hard, but it is the Law. Oh Jules ♥ Cassie is killing me with these snippets. Can it please be March 8? 12 days until Lady Midnight! It seems I’m already in love with this story of Emma and Jules!!!!!!!! I love this books series!!!!!!!!!!! This is bound to create a very tense story. I cant wait to read new Shadowhunters books. I know that Emma and Julian will probably end up together- very curious to see how this process will occur though! THAT’S SO SAD CUZ EMMA LOVES BEING A SHADOWHUNTER AND SHE’S REALLY GOOD AT IT! AND THEY LOVE EACH OTHER! AND I JUST CAN’T……..